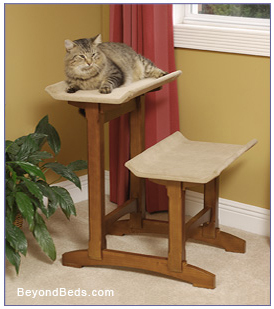 Mr. Herzher&apos;s Feline Furniture is designed to compliment your decor and showcase your cat in comfort and style. Every cat owner knows that fussy felines like to be the masters of their domain and yours. 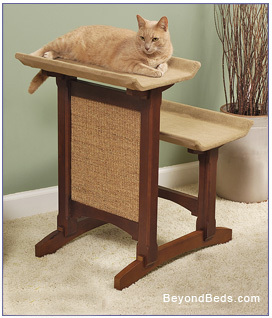 These finely crafted cat perches, sisal scratching surfaces and seats will divert your cat&apos;s attention away from your furniture and carpets to offer your cat a quality perch of his or her own. Constructed of solid wood in Cherry finish, Mr. Herzher&apos;s Feline Furniture features ample, cushioned lounging areas covered with long-lasting micro-fiber suede in a rich, neutral tone. 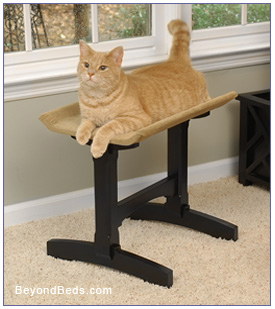 Raised seat edges and wide bases insure that your cat is cradled safely and solidly. Protective felt padding on the base of the furniture will prevent scratches and damage to both tile and hardwood floors. Available in single or double seat models, double seat available with or without scratching area. Mr. Herzher&apos;s Feline Furniture is an attractive, quality alternative to over-priced cardboard or carpeted particle board cat perches or scratching posts. The Deluxe Double Seat combines dual seating platforms with a dense, tightly woven, premium long lasting sisal scratching surface, the preferred material for claw flexing, scratch-loving cats. The Sisal scratching surface can also be easily replaced as needed. Available Colors: Cherry Stained Pine with a Polyurethane Finish. If you&apos;re tired of vacuuming up shredded carpet and cardboard bits from your floors, Mr. Herzher&apos;s combo scratching platform can be positioned either flat or at an angle, to protect your rugs and offer your cat an irresistible surface for his favorite pastime. Sisal Areas Front 7" x 19" and Back 7" x 12"
Note: Replacement components are available for all Craftsman Series Feline Furniture models.